This post comes from the NerdWallet.com team, personal finance bloggers and experts in helping users compare rewards credit card offers. If you’re like millions of other Americans who are struggling with debt problems, you may be forced to consider bankruptcy proceedings. 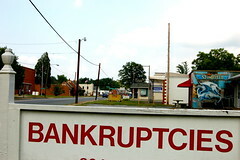 Many Americans have already taken advantage of filing for bankruptcy. Now, there are different forms of bankruptcy that fits the different needs of the consumer. The most popular form of bankruptcy is Chapter 7. It is called this as a reference to its section in the Bankruptcy Code. Chapter 7 is actually the most severe of all the types of bankruptcy types, terminating all unsecured debts like personal loans and credit cards. When filing for Chapter 7, you will in turn liquidate your non-exempt assets to pay off the creditors that you have. Most debtors aren’t affected by the liquidation of assets unless they own land or a second home. Yes, a lot of debts are thrown out the window when filing for a Chapter 7, but there are some that will be left behind. Some of these include mortgage and car loans, secured debts and property liens that are left over. So after you have filed for this, you will still be held liable for paying back any car and house loans you have, unless you decide to default on your payments, which will result in them being repossessed. Federal student loans are another type of debt that is hard to get rid of after filing for a Chapter 7. So unless you are able to prove that paying off the school loan would put you in substantial hardship or significant loss in quality of life, you’re going to be stuck paying it. Not many people are able to prove this after filing, so the loan debt sticks around. Some unsecured credit card debt is able to stick around, but only by judicial decision. In order to do so, the credit card company has to provide evidence of charges that are suspect, which in this case would be a fraudulent application or purchases made by the debtor who had no intent to pay it back to the creditor. Unlike with Chapter 7, Chapter 13 doesn’t require you to liquidate your assets. You can keep everything while you’re paying back your debts. So if you decide to file for Chapter 13, you can rest assured that your property is safe. The downside to filing for this is that none of your debts are really eliminated, like with Chapter 7. This means that you will have to pay off mortgage loans, car loans, student loans and other secured credit, but they will be structured in a way that will allow you to pay everything off within 5 years. Chapter 13 bankruptcy will also keep you liable for paying off unsecured debt, like credit or charge cards and personal loans. These debts will also be restructured to be paid off over a 5-year period, but have a lower priority than secured debts, such as mortgage and car loans. Other than being able to keep your assets, Chapter 13 has another advantage over Chapter 7, which is that it only stays on your credit history for 7 years. With Chapter 7, a black mark is on your credit for 10 years. The reason that Chapter 13 clears off sooner is because the debtor is paying back their debts. Plus, Chapter 13 gives you three to five years to catch up on accounts that are delinquent and places a hold on calls from bill collectors. You’re only required to make one monthly payment to the bankruptcy trustee, who will give the payouts to the different creditors that you owe. Which to Choose, Chapter 7 or Chapter 13? As you have read, both types of bankruptcy have their pros and cons. The one that will best suit you all depends on your own personal situation. In most cases, there is a judge in charge of determining which is suitable for the debtor. This is determined by the debtors means, and whether they’ll be able to repay the debt in the future. So if you have assets and are employed with an average income, you are a better risk for making repayment and would probably have to file for a Chapter 13. On the other hand, if you are unemployed without assets and limited income, you are a bigger risk and would be ordered to file a Chapter 7 bankruptcy. You are only able to file for a Chapter 13 bankruptcy if you have unsecured debts that are below $360,475 and secured debts that are below $1,081,400. You can definitely find much needed relief from your current debts with both forms of bankruptcy, but both come with long-term consequences. When you have a bankruptcy on your credit history, it will prove to be quite damaging to your credit score. In some cases, it takes longer than 10 years to recover from your bad credit. So before you decide to file for bankruptcy, you should first consult with a lawyer to see if debt counseling and debt consolidation would be better options. I hope I never have to utilize this knowledge. It’s interesting that there are so many different types.